There are a number of things that you have to be concerned with when you install a marble tile floor. While the material itself is relatively delicate, you have to be aware that the grout lines that surround each tile are also susceptible to moisture penetration, stains, and the growth of mold. If not properly cared for, over time these lines can become dark, nasty ropes of horror lacing beneath your feet. Removing and then re-grouting these lines is a great way to revitalize the look of a marble installation without having to go to the expense and hassle of completely re-doing the floor. It is a relatively easy project, and it can be done quickly, allowing you to make a dramatic improvement for a small investment. Time to Complete: 1-2 hours work, and an additional 4 hours drying time. It is important to note that marble is a very porous material. If left unprotected, both dry dust and wet grout can soak into the pores of these tiles, causing permanent stains. That is why the very first thing that you want to do is to apply a coat of a marble surface sealing agent to the entire floor. This is especially important if it has been more than six months since the last time you applied sealer to it. Using a grout saw or an electric tool such as a Dremel with an appropriate attachment, begin to remove the grout from between the marble tiles. As you work, be very careful to avoid the edges of the tiles themselves, as you do not want to chip or scratch them. This can kick up a lot of grout dust, so make sure the area is well-ventilated. You may also want to wear a breathing filter. If you just want to do a quick job you can remove the grout down just the middle of the joints between the individual pieces of marble. This will allow you to finish the job quickly and will look somewhat better. However, you should strive to remove all of the grout as thoroughly as possible if you want the best look and the most consistent coloring. When you're done there will probably be a layer of grout dust lying across the entire floor. Sweep or vacuum this away to remove the majority of it. Then mop the floor down, using an equal parts solution of water and vinegar. Allow this to dry completely before you move on. Mix the grout according to the manufacturer's instructions. If desired an entirely new grout color can be used. The options available to you range from black and charcoal to grays, browns, whites, and even a few rustic reds. A new grout color can change the look of a room almost as much as an entirely new floor. 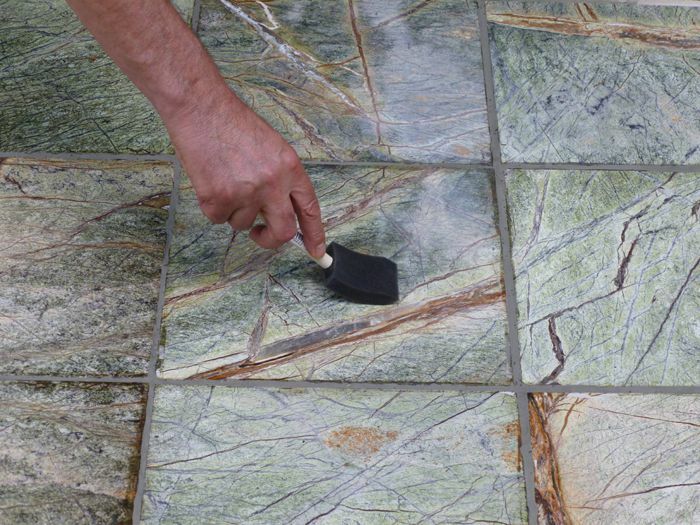 Use the grout float to apply the grout to the seams between the marble tiles, holding it at a 30-degree angle as you sweep it across the floor;s surface. Swipe excess grout away as you work, making certain not to allow it to dry on the marble. Use a large and slightly damp sponge to wipe the grout clear from the surface of the tiles. You want to remove the grout before it has a chance to set. At the same time, you want to be careful that excess liquid doesn't spill off of the sponge, and run off into the grout seams, turning the mix into a soupy mess. You should also take care to avoid swiping bits of grout out of place with a careless sweep of the sponge. Give the grout at least 24 hours to completely dry. Then you need to apply another coat of chemical surface sealer to the floor. This is because grout is a porous material, and it will also need protection against moisture penetration and staining agents. A second coat of seal will also help to protect the surface of the tiles themselves. Should You Paint Walls or Refinish Floors First?